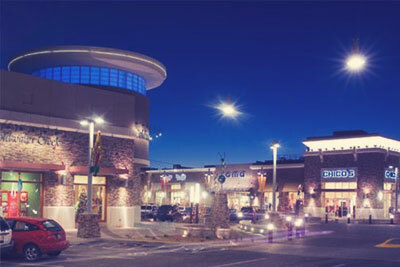 ABQ Uptown is your ultimate destination for upscale shopping, home furnishings, entertainment and dining.You'll find it all in a pedestrian-friendly, open-air lifestyle center. When you see the big blue, yellow, and red “Q” at the intersection of Uptown Boulevard and Q Street, you know you are in the right place. 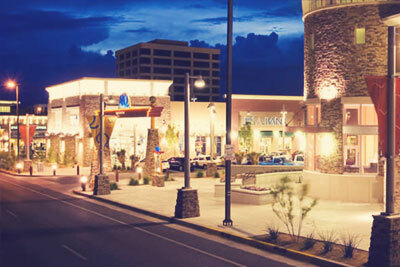 It’s ABQ Uptown, the perfect place to shop, walk, and eat in a just-right, outdoor environment. With approximately 220,000 square feet of retail shops, restaurants, ABQ Uptown has a unique mix of stores that create a completely new and refreshing shopping experience for the community and its citizens. Named “Project of the Year” (2006) by the New Mexico Chapter of Certified Commercial Investment Members, a national organization. Classic mixed-use city neighborhood that developed on a vacant 20-acre brownfield site between two retail malls in the city’s Uptown area. 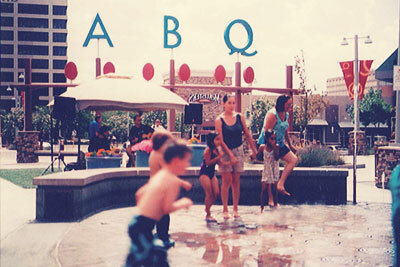 Impetus for the development was a sector plan adopted by the city of Albuquerque that required construction on the site to be high density. The development presented some unique challenges such as sitework, retail coordination, infrastructure, zoning, mixed construction types and parking. Street landscaping, plazas, fountains, outdoor dining areas, residential courtyards and portals were used to reinforce the urban fabric. Today, the highly visible blue, yellow and red lighted “Q” at the intersection of Uptown Blvd. and Q St. invites all to shop and enjoy the Uptown experience.